For all my fellow beauty junkies out there, the time of year is here when it's best to stock up on your cult favorites and pick up a few newbies to try! When it comes to beauty products (for the most part) I stick to my holy grail brands that have looked good every time. For me, this means Laura Mercier's Flawless Fluide Foundation. I have combination skin. It took me MONTHS to find the right foundation that wasn't to heavy, to thin, the right shade and wouldn't cause breakouts. After I was about to give up hope, I stumbled upon this wonder and her many, many shades. Thankfully she had just the selection for olive skin tones like myself, with perfect balances of undertones and pigment. I can't recommend this enough! I've been wearing Gucci Guilty for at least 7 years as my evening/dressier scent, and it smells delicious. Looking for an inexpensive curling wand that works wonderfully? This Hot Tools 1-1/4 inch wand is my go-to. Also these Drybar clips are the best for securing your hair out of your face or into sections while styling! Yellow just also happens to be one of my favorite colors, too. Wanting a quick brow touch-up so they're filled and shaped like a celebrity? Smashbox's Brow Tech To Go is my absolute favorite. The rest of the world would be so afraid of my brows without this baby. And at the end of the day, when you want a skin restart, kick your feet up on the couch while wearing this GlamGlow mask that will clear, even and brighten your skin for a gorgeous glow. 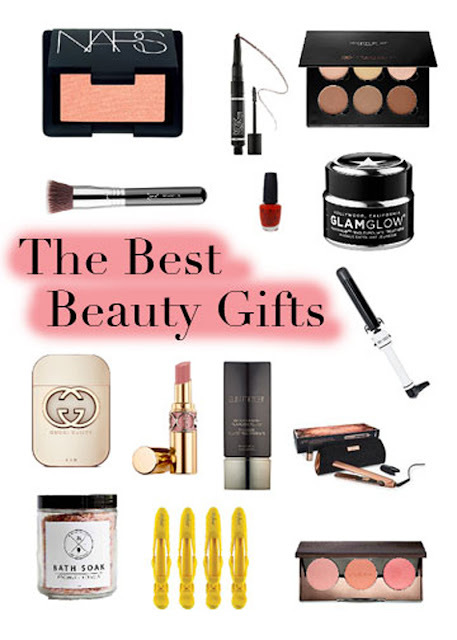 Treat your beauty lover to one of these must-haves this holiday! so many goodies! i LOVE the nars blush! I'm in the market for a new curling iron- thanks for the rec! So many great goodies in this guide! That polish looks like it might be the perfect red. And there are so many things in here that I haven't tried! So good. So many fabulous beauty gift ideas!! I am obsessed with Nars blush and I am definitely interested in trying that Laura Mercier foundation! I used to never care about beauty, like my makeup bag had like 3 things in it but the past few months I've become obsessed! I want all of these gifts! Any beauty lover would love any of this! I love the curling wand! I have a few of these beauty products that I own and love. I will definitely have to check out the other ones on here! AMAZING! Loving all these selections!! My daughter would enjoy getting these beauty gifts. I might even grab extras for myself.